OUR VISION: "A NEW DAY" PROJECT IS A CAMPAGN TO GET AT LEAST ONE MILLION TO TOUCH AND AGREE IN PRAYER FOR OUR NEW PRESIDENT BARACK OBAMA AND RAISE FUNDS TO OPEN ("A NEW DAY") YOUTH CENTERS AND GYMNASEUMS ACCROSS THE NATION IN LOW INCOME COMMUNITIES, WHICH CATER TO AT RISK YOUTH AND TEENS. Thank You for joining us in this link of prayer for Barack Obama and family: We are one Million who will touch and agree in prayer for our President and "A New Day" for our youth in America. LET US REJOICE AND BE GLAD IN IT, FOR THIS IS THE LORD'S DOING AND IT IS MARVELOUS IN OUR EYES. A SOLEMN PRAYER FOR PRESIDENT (ELECT) BARACK OBAMA OUR BROTHER IN THE LORD. A CAMPAGN AND LINK TO BUILD YOUTH CENTERS IN LOW INCOME COMMUNITIES ACCROSS THE COUNTRY. Can we reach one million?......YES WE CAN! You can help us grow, by telling your friends about this site. Watch us grow, check back with us for changes and updates. PLEASE BECOME A FAITH PARTNER AND JOIN THIS PRAYER FOR OUR NEW PRESIDENT BARACK HUSSEIN OBAMA. GOAL: ONE MILLION PRAYER PARTNERS. Congratulations to our New President Elect: Barack Hussein Obama. THANK YOU, FOR YOUR PRAYERS. click here: Then click on picture to see mystery candidate who almost beat Barack Obama for the Presidency. 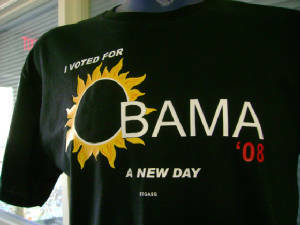 click here: ELECTION NIGHT PHOTOS.......A NEW DAY INDEED. click here: FOR MORE GREAT ELECTION PICTURES. WE THANK YOU FOR YOUR PURCHASE, WHICH HELPS BUILD A BRIGHTER FUTURE FOR OUR YOUTH.